A crown is a protective cap used to treat a tooth that has become damaged by decay or infection. In some cases, it is also used in cosmetic dentistry to improve the color and shape of a tooth. 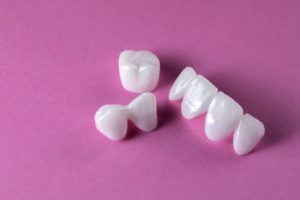 It is not uncommon to need a crown in combination with other treatments, like a bridge, root canal, or dental implants. To get your crown, your tooth is reshaped, and impressions are taken to design your restoration. It can take the dental lab a couple of weeks to create it to meet your exact needs. In the meantime, a temporary crown is attached until your permanent one is ready. After your dentist in DeLand places your crown, it is normal to experience some pain or swelling around your tooth; however, it should dissipate in a few days. To manage your discomfort, use over-the-counter pain relievers. Your tooth can be a bit tender for a while when chewing, so you may want to avoid placing pressure on it. Soon, you will chew without any issue. With the right aftercare, your crown will last an average of 10 years before needing to be replaced. To promote its longevity, it is best to brush your teeth twice a day and floss every night. Clean the area where your crown meets your gum line to remove plaque and bacteria. It is best to avoid chewing any sticky or gummy foods, which can pull your crown off. It is also a good idea not to chew overly hard foods with it because they can cause your crown to crack. When taking large bites, shift the bulk of your food to the opposite side of your mouth. In addition to your home care, do not forget to visit your dentist twice a year for a cleaning and checkup. They will check your crown to ensure it has not been compromised. If it is damaged, it can easily be replaced. Do not delay getting the care you need. You can save your smile with a natural-looking dental crown. For over 23 years, Dr. Christopher Cowell has provided his patients with quality preventive, restorative, and cosmetic dentistry. Although he tries to keep patients out of his chair, there are times when you may need a dental crown to save your smile. If you need to repair a tooth, contact our office today to schedule a consultation.